PDF WordSmith is an iPad app developed by KDAN Mobile Software LTD. 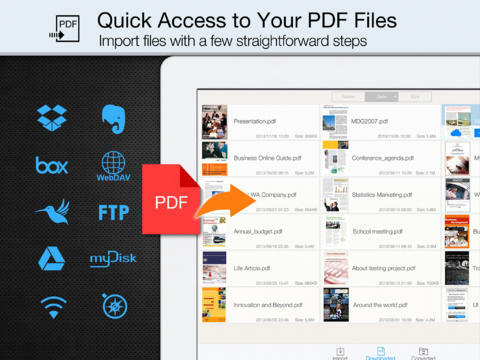 This iPad app is a really great tool for converting PDF file into Word files. In my past reviews of KDAN’s products, I’ve had nothing but good things to say. What sets KDAN apart from the competition in my eyes is a blend of gorgeous design and comprehensive functionality. 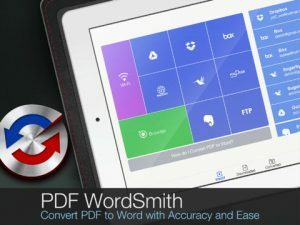 PDF Wordsmith definitely continues KDAN’s tradition of gorgeous, intuitive apps. From the main screen, you can easily import PDFs from the most popular cloud services, including Evernote, GoogleDrive, Dropbox, Box, SugarSync and MyDisk. FTP and WebDAV clients are also supported. Also on the main screen, you can easily review your downloaded and converted files. Keeping these files all in one place makes it easy to find your recent work without too much searching. 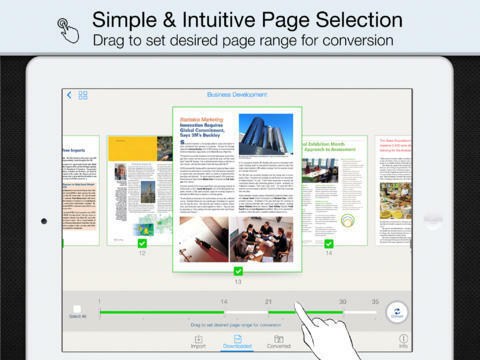 Once files are imported, it is easy to preview individual pages. Everything about this app feels thoughtfully placed. Beyond just the import interface and the listing of files, the developers have made it easy to report bugs, ask for additional functionality, or ask general questions. The importation process could not be more simple. The app, on the whole, performs very cleanly. There were no crashes or bugs experienced during testing. The interface is quite excellent, with lots of small touches that make the overall design feel intuitive. One tool that really stuck out to me was the page range selection bar, which allows users to specify a range of pages for conversion. If you often find yourself needing to edit PDF documents on the go, or needing fill in information on PDF forms, this conversion tool is well worth the somewhat steep asking price. And yes, it does support conversion of password protected PDFs! PDF WordSmithrequires iOS 5.0 or later. Compatible with iPad.